Introduction: This article from The Telegraphist of January 1st, 1886, reviews the career of James Graves, who was Superintendent of the Valentia Cable Station from 1866 to 1909. In 1884 Graves wrote an article On The Causes Of Failure Of Deep-Sea Cables, which was published in the Journal of the Society of Telegraph-Engineers and Electricians. Thanks to Jim Jones for supplying the original material for this article. In January 2018 Don Fox published an article titled "James Graves (1833 – 1911), his Descendants, the Electric Telegraph and Valentia Island" which provides many additional details. 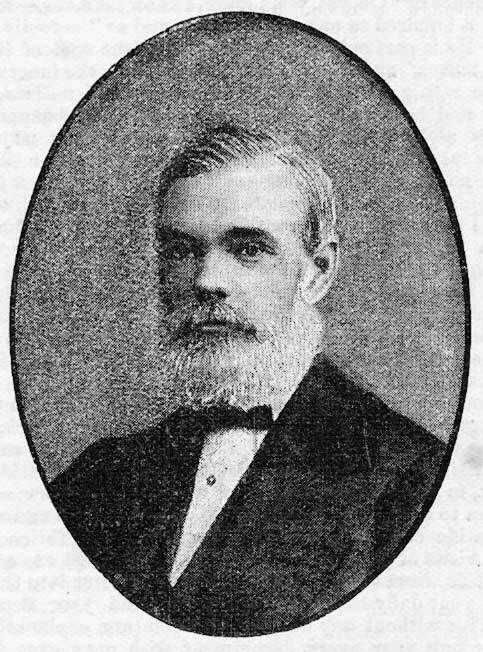 We are enabled this month to present our readers with a brief sketch of the career of another distinguished British telegraph clerk, whose name is familiar to many of the subscribers to THE TELEGRAPHIST. MR. JAMES GRAVES was born on the 4th August, 1833, at Chesterton, near Cambridge In his infancy his parents removed to Cambridge, and remained there till June, 1844. During this interval he received an elementary education at the East-road Schools, of which Mr. John Newland was then the head-master. His father having been appointed to the mastership of the school at MeppershalI, Bedfordshire, by the Rev. Henry Howarth (subsequently transferred to the rectorship of St. George's, Hanover-square, London), Mr. Graves studied with and assisted his father in his scholastic duties. In January, 1848, his father removed from Meppershall to take the mastership of the village school at Hoo, near Rochester, Kent, and there Mr. Graves remained for two years longer. In January, 1850, he was appointed by the Rev. Thomas Dale to the Assistant-Mastership of the St. Pancras National School, Euston-square, London, and continued his duties there until, owing to the introduction of the "pupil teacher system," his services were no longer required. From June, 1852, to December of the same year, he found temporary employment in a law stationer's office near Chancery-lane. On the 26th December he entered the Electric Telegraph Company as a learner, at Founder's-court, Lothbury; and after three weeks' probation, Mr. Graves was appointed to a clerkship in "Jackson's Gallery," at a salary of 14s. per week. A new wire was being put up between London and Southampton, for a "printing" circuit, and in February, 1853, he was transferred to Southampton Station as printing clerk, at a salary of 14s. per week and 3s. per week "subsistence money," the two sums being merged into one by a promotion, on 1st October, 1853, to 17s. per week, and no subsistence money; the only difference this made was to increase the rate of pay for overtime from 4d. to 5d. an hour. In April, 1855, Mr. Graves was appointed as clerk to the Admiralty at Clarence Yard Victualling Stores, Gosport, at £1 per week, but as there was no chance of his making any overtime there, it was in reality a reduction of income, although considered a promotion in position; he therefore respectfully declined it, and another clerk was appointed. On the 4th August, 1855, he, on his twenty-second birthday, rejoiced over a promotion to £1 a week, and in March of the following year he married, at Southampton, Anne Charlotte, daughter of Richard Smith, Esq., land surveyor, of Hoo, Kent. At the new year, 1857, he was promoted to 22s. per week. During that year the Emperor and Empress of the French paid a visit to Her Majesty at Osborne House, Isle of Wight, and Mr. Graves was selected to do the telegraphic work during their stay. For the proficient manner in which that duty was done he was awarded a gratuity of £1 on the 25th of August, on the recommendation of Mr. C.F. Varley. This gentleman was also instrumental in effecting the removal of Mr. Graves from Southampton, in October, 1857, to the Foreign Gallery at Founder's Court, at a salary of 26s. per week, and upon this promotion he removed with his wife to take up his abode in London. During the summer of 1858 the Channel Islands Telegraph Company laid cables from Weymouth to Alderney, Guernsey, and Jersey, and Mr. Graves was appointed to the latter station, the line being opened by him by the transmission of a message from the Governor and the officials of the island to Her Majesty, copies of which, together with the reply, were freely circulated upon cards, while a select few were printed upon white satin. Mr. Graves's appointment was fixed at 30s. per week, from the 9th of September, 1858; but, on the 11th of January, 1859, he was promoted to the charge of the station at 40s. a week. The meteorological observations under Admiral Robt. Fitzroy's storm-warning system were placed under Mr. Graves's charge, and for this service an additional 3s. per week was added to his income in December, 1860. The appointment of submarine electrician to the Monarch, belonging to the Electric and International Telegraph Company, having become vacant by the resignation of Mr. George Preece, Mr. Graves was appointed to fill the vacancy upon the recommendation of Mr. C.F. Varley, and thereupon, in May, 1861, Mr. Graves removed from Jersey to Lowestoft, the head-quarters of the old Monarch, at a salary of 45s. per week. While engaged in that capacity he (with Captain James Blacklock) succeeded in picking up the remains of the old Orfordness-Scheveningen Cables. The new Lowestoft-Zandvoort Cable was tested by him during its manufacture at Greenwich; and a lot of old cable at Lowestoft was overhauled, faults picked out, and the good pieces spliced together with a view to laying an extra cable between Holyhead and Howth, but, before it was completed, and by an alteration of circumstances and plans, a new four-wire cable was ordered to be made, and this was laid from South Wales to Wexford. All the working cables of the Company being in good order, Mr. Graves was removed from Lowestoft to London to act as travelling assistant to Mr. Varley in October, 1862, at the same salary. While thus engaged he repaired, in an open boat in November, the Dublin cable off Holyhead, and for his exertions on this occasion he was awarded a gratuity of £1 on the 9th of December, 1862. Mr. Graves also visited Newcastle-on-Tyne, and fixed the apparatus for firing the time guns at that place and at North Shields. He also visited South Wales and Ireland, intro­ducing Mr. Varley's Universal Differential Galvanometer to the District Superintendents upon the establishment of the daily system of testing wires. He also thoroughly examined the wires in the neighbourhoods of Cork, Middleton, Youghal, Queenstown, and Roche's Point. Upon another occasion he examined the wires passing through the Bangor tunnels, and reported upon a means of avoiding the tunnels altogether. When the Atlantic telegraph scheme was revived, Mr. C.F. Varley was appointed chief electrician to the Company, and by a mutual arrangement Mr. Graves was lent by the Electric and International Telegraph Company to the Atlantic Telegraph Company to act as Mr. Varley's representative at Greenwich to test the cable during its manufacture and shipment at a salary (to be paid by the latter Company) of £200 per annum from the 24th of May, 1861, whereupon Mr. Graves took up his residence in Greenwich. This work having been performed throughout to the satisfaction of the Board of Directors of the Electric Telegraph Company, Mr. Graves was by them appointed to the superintendence of their Valentia station on the 25th of June, 1865, at a salary of £350 per annum, at which rate and in which position he was transferred, on the 27th of July, 1866, to the Anglo-American Telegraph Company. In 1870 he undertook the electrical work on board the Robert Lowe, in connexion with the repair of the 1866 Atlantic cable off Newfoundland, in conjunction with Captain James Blacklock, with whom he had been associated on board the old Monarch, and, after successfully completing that repair, proceeded in the same vessel to repair the French Atlantic Company's cable then broken some thirty miles south of Cape Sable, Nova Scotia, which was also successfully accomplished. An examination of the shore-ends and landing-place of the cables at St. Pierre, Miquelon, concluded the objects of the voyage, and Mr. Graves reached home in safety (after an absence of 110 days) on 22nd October, to learn that his salary had been increased to £400 a year, as from the 1st July. Just three years afterwards it was further increased to £500 per annum. In the summer of 1874 he acted as electrician during the repairs of one of the cables off the Island of Valentia, in the steamship Minia. During the preceding few years the Atlantic traffic had considerably developed; the new station and houses had been erected by the Anglo-American Company, and much laborious work had been done by Mr. Graves, and this was not only appreciated but substantially recognised in a further addition to his salary, making it £600 a year, "in consideration of long, faithful, and efficient service." For several months Mr. Graves assisted Mr. J.B. Stearns in his protracted experiments with a view to adapt his duplex system to Atlantic cables, in which they were finally successful, and it has been applied by Mr. Graves to all the Atlantic cables subsequently laid and worked from the Valentia station. In April, 1882, the German Union Telegraph Company connected the Valentia Station with Emden, North Germany, by a submarine cable, and Mr. Graves was appointed their Superintendent, conjointly with his former duties, and for this extra appointment he receives an additional salary of £100 per annum. Mr. Graves has been connected with the Society of Telegraph Engineers and Electricians since its formation. He was elected a member of the Society of Arts in 1874, and Membre Fondateur de la Societe Internationale des Electriciens in 1883. Numerous cable operators, trained at Valentia under Mr. Graves, are now holding positions in other Companies in every quarter of the globe. Few, we think, even amongst "old electrics" can show each a career as his, during the thirty-two years which he has spent in the telegraphic service of his country.